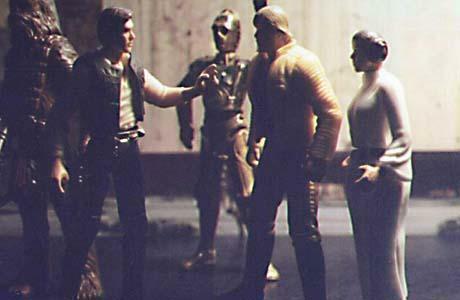 “Well, s’long yer highness,” Han drawls. “Your little revolution helped break monotony a little. 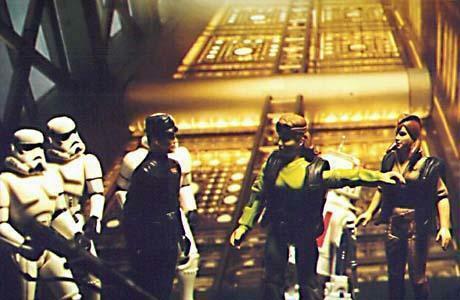 As the Millenium Falcon departs Yavin 4, the space pirates return to their routine. 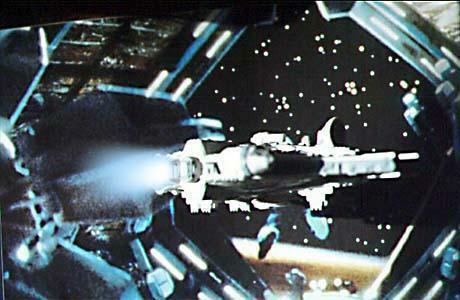 The proximity alert goes off as the ship exits hyperspace. 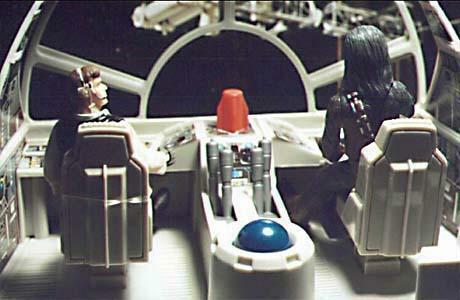 Solo and Chewie head for the cockpit. 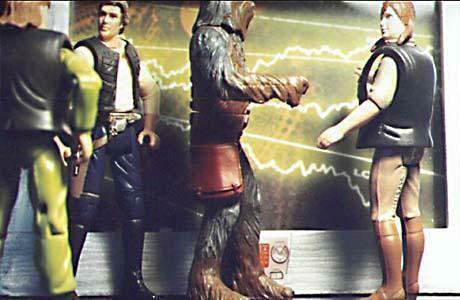 Chewie concurs with a throaty growl. 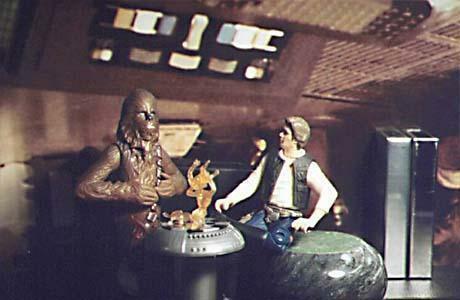 “Standby, Chewie. We’re coming up behind Therax 3. 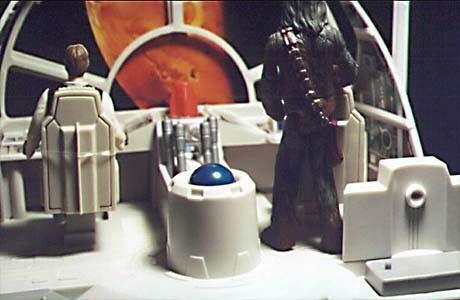 As Chewbacca performs the proper calculations, the space station comes into view. 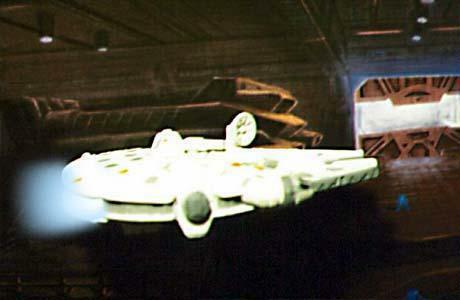 …and in through the open docking port. 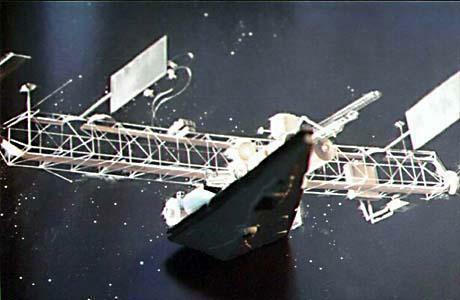 Remote systems steer the Corellian ship to its proper berth. 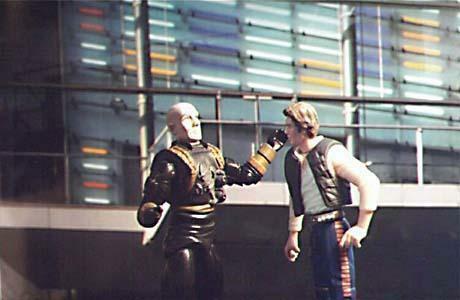 The controller’s voice crackles over the audio pickup. 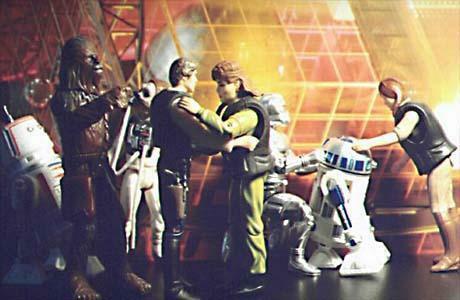 Warm greetings are exchanged between Jessa and Solo. “I never thought you’d come back!” she exclaims. 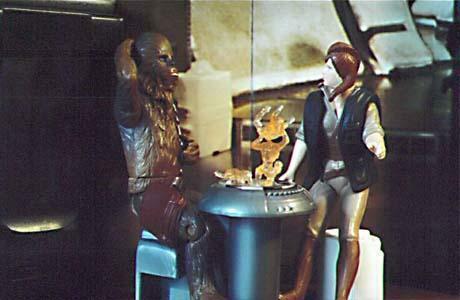 “Chewie, it’s always a pleasure to see you!” Jessa beams. Collette, Jessa’s master mechanic, displays a schematic of the YF-100. 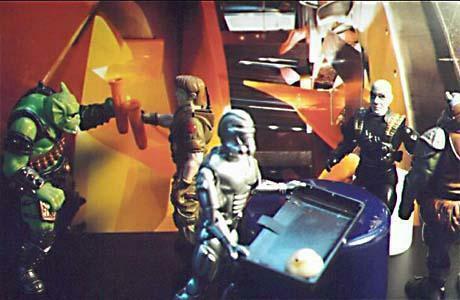 “You’ll need a new Zeratron module. 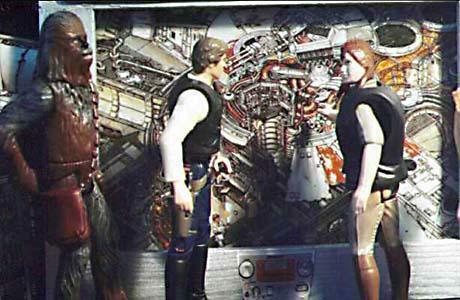 The capital-ship fire you took fried yours out.”\mChewie lets out a muted howl of pain. “Oh, it’s not so bad. There’s an old Firespray that pulled in right before you did. 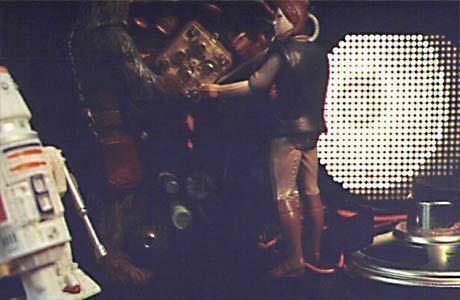 I can take a spare one from it if the owner doesn’t mind,” Collette reassures the Wookiee. 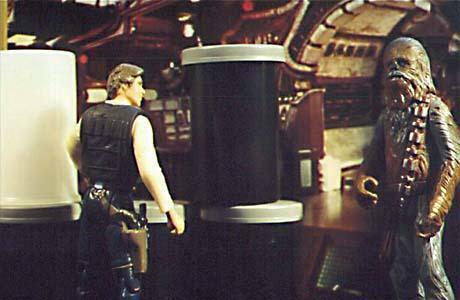 “Honey, spare no expense,” Solo smiles. Jessa’s midpoint refueling station is a stopover for spacefarers of all races. 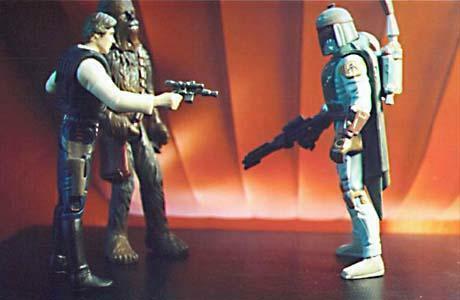 Solo’s reflexes tighten upon seeing the armored figure of the Mandalorian Bounty Hunter. 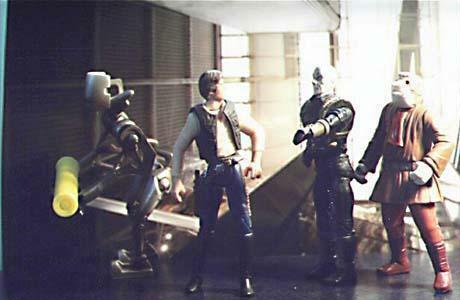 “Jabba just wants to make sure he gets his money,” rasps the bounty hunter. 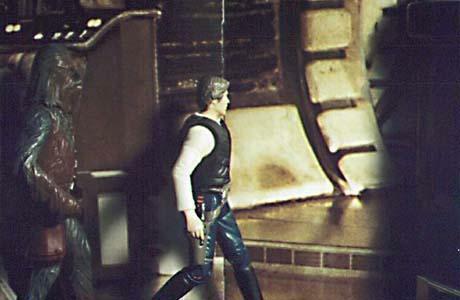 Solo heads back to the docking bay, but is detained by an unusual stranger. “Oh really? This had better be good,” fumes Solo. “I understand you came into a little… ah, windfall, shall we say?” he begins. 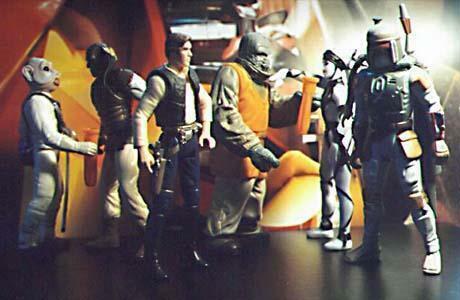 “Uhhh, Mr. Fett, sir—The Corellian’s talking to the merchant banker. You told me to keep an eye out for him.” says Manfred, one of Jessa’s workers. 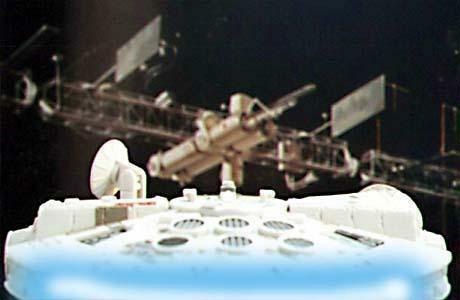 In the dim recesses of the Falcon’s hold, Collette finishes installing the Zeratron module. The lighting levels increase as the new component is successfully installed. 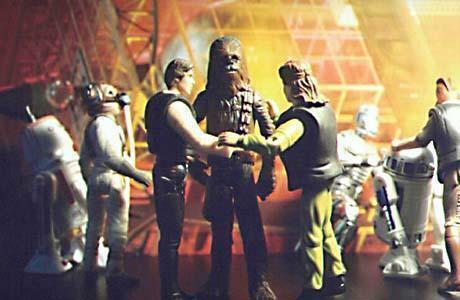 Chewbacca growls a hearty approval. “Why, you’re welcome, I guess!” she laughs. 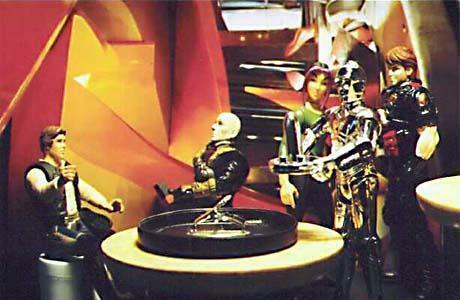 “I hadn’t played Dejarik for years, thanks Chewbacca.” says Collette. 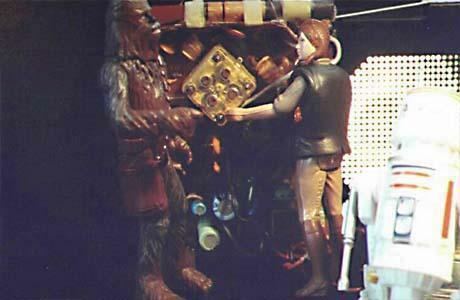 The Wookiee grunts in satisfaction. 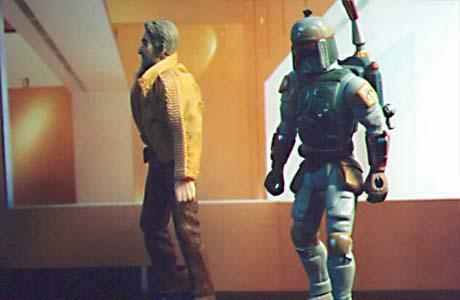 The bounty hunter approaches Solo with weapon drawn. 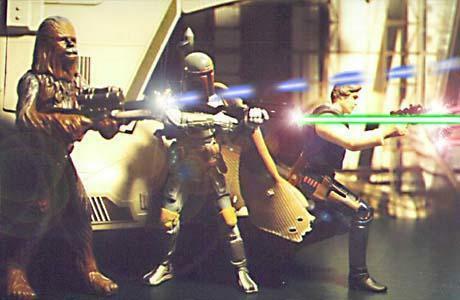 But solo quickly covers Fett with his own blaster. 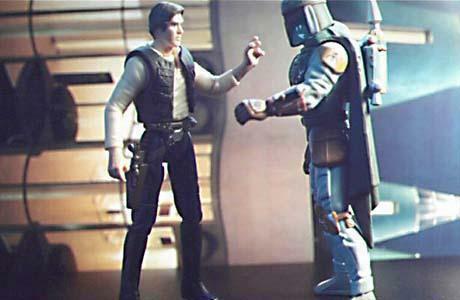 “I’m not your errand boy, Solo.” replies the bounty hunter. 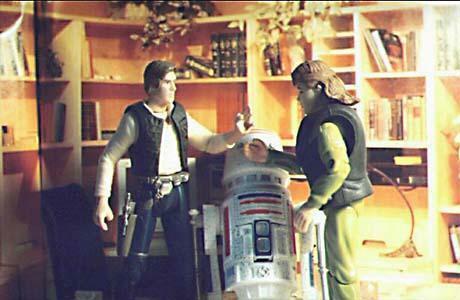 “Yeah, but Jabba will love you for it.” Han sneers. 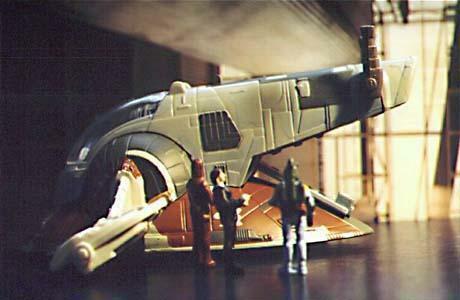 “This is the Imperial Cruiser ‘Warhammer’. You are being boarded. 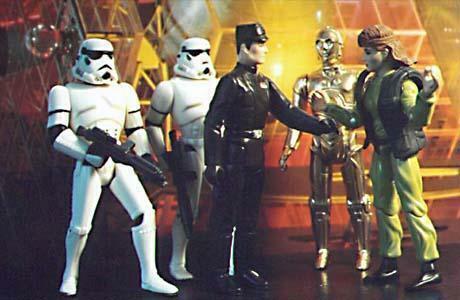 We are searching for dangerous fugitives.” broadcasts a no-nonsense Imperial officer. 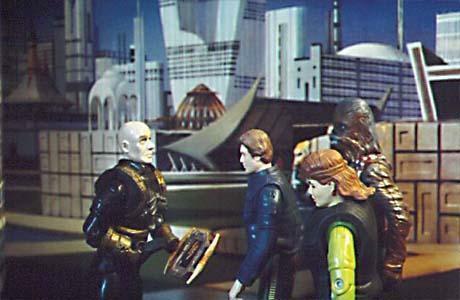 “I am Captain Broca,” the Imperial tells Jessa. 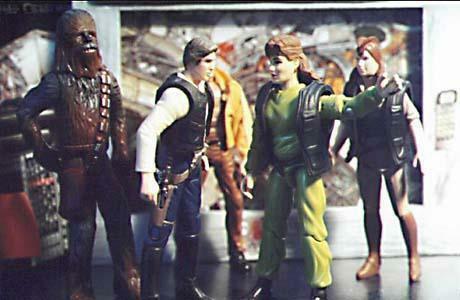 Jessa warns Han, Chewie and Fett that the Imperials are on the station. Jessa shrewdly deceives the Imperials. 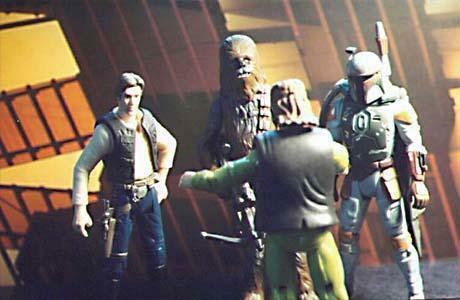 While the pirates and the bounty hunter argue, blaster fire interrupts their discussion. 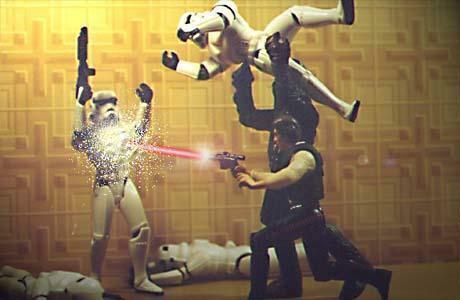 A roaring Chewbacca tosses a stormtrooper down a hallway, growling. 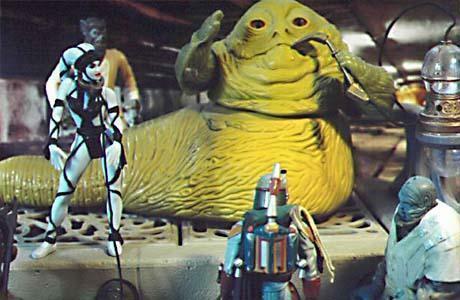 “Akuda bo gnaga, Fett.” rumbles Jabba the Hutt on Tatooine. 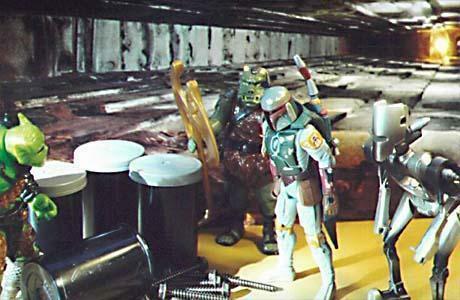 In silent rage, the Mandalorian bounty hunter sees that the treasure bins hold nothing more than burned-out spare parts. 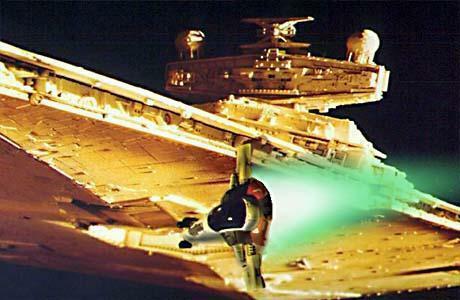 A desire for revenge burns within Boba Fett. 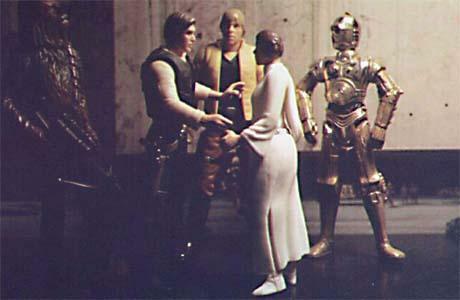 “The transaction is complete.” says the banker. 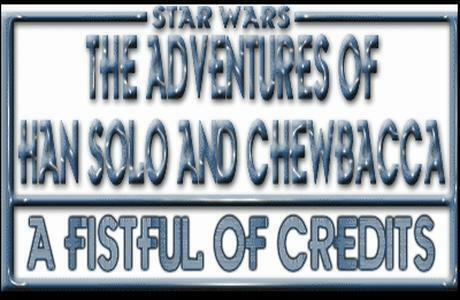 Chewbacca’s doubtful growl casts a pall on the event.